My trainer has suggested that I try to shift my larger meal more towards the center of the day. Although I don’t think this will work, given our lifestyle, today I try to eat a bigger lunch and a smaller dinner. We have leftover stuffed peppers from last night so we each eat a stuffed pepper half for lunch plus additional filling. Originally we were going to make this cod dish with polenta as we usually do but decided to just serve it with the collard greens and corn instead. It’s a baby step towards eating more reasonably. John marinates the fish in olive oil, thyme, bay leaves, paprika, garlic powder, lemon zest, and a dash of cayenne. Before putting it in the oven he seasons the cod with salt and pepper. Since this particular cod is on the thin side, he cooks it for 8 minutes at 400F. In the meantime I chiffonade the collard greens after removing the central rib. Next I saute a little garlic cut in slices and some chili flakes in a little oil. I remove it from the pan to be added back in at the end so it won’t get burnt. In goes the rinsed chiffonade of collard greens. Just the water clinging to the pieces is enough to steam them. I add salt, a little sugar, and some lemon juice. They cook in about three minutes. Then I add the frozen corn and finally the garlic. The vegetable is done just before the fish. The dish is served with the collards on the bottom, then the fish, and finally a parsley sauce. The parsley sauce is made in the blender and is a bunch of parsley, some water, some lemon, olive oil and salt. A really successful and tasty dish. 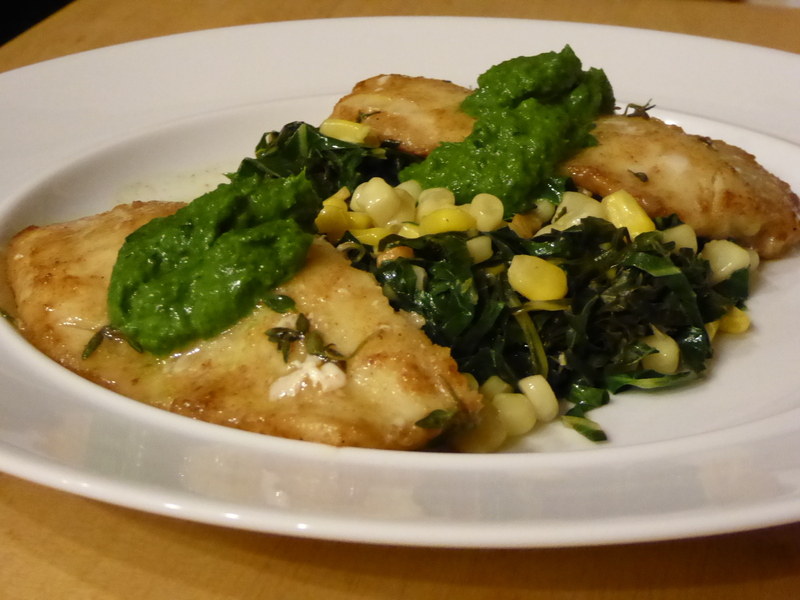 This entry was posted in Fish and tagged cod, collard greens, corn, Pacific cod, parsley sauce. Bookmark the permalink.